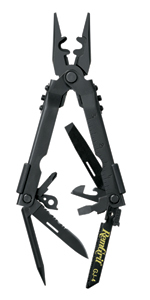 CLOSE OUT $145.00 Gerber D.E.T., black Multi-Plier. 5-1/8" closed length. Stainless steel locking blade. Black ballistic belt sheath. Blasting cap crimpier. Made in U.S.A.